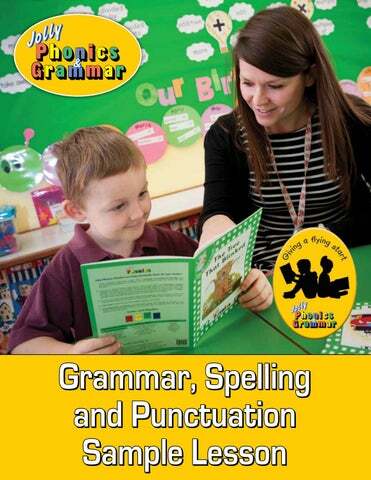 Our spelling, punctuation and grammar sample lesson is designed to show how a synthetic and progressive approach using the Jolly Phonics & Grammar program will enable you to develop children’s learning as they become confident readers and writers. This sample lesson will give an example of punctuation, one grammar concept and one spelling pattern taught through the years. This sample lesson focuses on our core delivery resource, the Phonics & Grammar Teacher’s and Student Books. 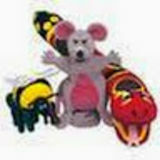 The Teacher’s Books are comprehensive guides containing detailed notes and lesson plans. These are accompanied by the full-color Student Books, which are individual write-in books for each child in your class. Each page in the Teacher’s Book correlates to the matching page within the Student Books. In the first year of Phonics, there is one Teacher’s Book that covers three Student Books. (One for each term of their first year at school.) This contains daily lesson plans for the entire first year. From the second year (Grammar 1) through to the seventh year (Grammar 6) there is one Teacher’s Book that covers one Student Book for each year. There are two lessons per week; one spelling and one grammar or punctuation lesson. This enables you to cover the core content required to achieve fluency in the English language whilst retaining the flexibility and time to cover other topic work within the school’s literacy scheme. This sample lesson will guide you through an example of a grammar concept being taught through the years. It looks at how verbs are taught, and the progression through each year as children build on their previous learning systematically and are introduced to new concepts. Children are introduced to the past, present and future tenses. They learn to add ‘-ed’ to regular verbs in the past tense. For the future tense, children learn the auxiliary verbs ‘shall’ and ‘will’. Children learn that some verbs are not regular. This means that they cannot just have ‘-ed’ added to the end of the verb root to change them to past tense verbs. Instead, some need to simply be learnt as ‘tricky verbs’. Up until now, children have learnt the simple past, present and future tenses. Now they are introduced to the continuous tenses using the verb ‘to be’ as the auxiliary and ‘-ing’ as the verb root. For example, ‘I was running’, ‘I am running’ and ‘I shall be running’. With children learning to parse sentences, they will also learn to parse verbs. They will learn how to identify the first, second and third person in singular and plural forms, rewriting sentences to check that everything agrees grammatically. Children will learn that when the subject of a sentence is actively doing the verb it is written in the active voice, but when the subject receives the verb action it is written in the passive voice. For example, ‘The man drove the car’ and ‘The car was driven by the man’. After being taught the essential phonics skills during the first year, children are introduced to the various forms a verb may take within different tenses. Starting with the simple tenses, teaching is systematic and progressive as new tenses are explored. They will also learn to parse and re-write sentences to ensure they are grammatically correct, identifying the person speaking and the voice used. This sample lesson will guide you through an example of a spelling concept being taught through the years. It looks at how the /ai/ letter sound is introduced, and the progression through each year as children build on their previous learning systematically and are introduced to alternative spellings. Revises the main alternatives of /ai/ for spelling: <a_e> and <ay>. Children are taught one spelling per lesson; first introduced to <a_e> and later <ay>. Each lesson has a spelling list of 10 words, including 5 /ai/ words. Revises the main ways to write /ai/: <ai>, <a_e> and <ay>. Later in Grammar 3, children will also learn that /ai/ can also be written as the vowel <a>. Each lesson has a spelling list of 18 words that contain the /ai/ sound. Children learn that the vowel sounds in unstressed syllables are often swallowed and become neutral (the schwa). This includes the /ai/ sound in words like ‘private’ and ‘abdominable’. Incudes a spelling list of 18 words with this sound. Children are initially taught one way of spelling a sound, before gradually being introduced to alternative spellings of such sounds. This will start with common variations, before progressing to other, more unusual spelling patterns that may appear as the children widen their vocabulary for reading and writing. They will also identify the opposite; where similar spellings can result in different sounds. This sample lesson will guide you through an example of different punctuation being taught through the years. It looks at how a selection of different concepts are introduced, and the progression through each year as children build on their previous learning systematically and are introduced to new punctuation. Children are not explicitly taught punctuation during the first year, yet will be encouraged to identify capital letters and full stops and use these within their writing; lots of opportunities to practice are provided throughout the year. In this lesson, children are introduced to speech marks. Children will start by thinking about the text within speech bubbles, and then looking at how this speech is put in between speech marks when written in a sentence. In this lesson, children are introduced to exclamation marks. Children will learn to use them when strong feelings may influence speech or writing, and how they should fit within speech marks. In this lesson, children will develop their ability to use a hyphen. They will see how they link prefixes with root words and whole words together to make compound words. A selection of activities give them an opportunity to practice using hyphens. In this lesson, children are introduced to parentheses. Having previously looked at bullet points in vertical lists which can provide essential information, parentheses can give the reader an extra piece of interesting information. In this lesson, children will extend their understanding of colons. They will look at how a sentence can be expanded by adding a colon, providing additional information and emphasising its importance. Children are introduced to punctuation and continue to revise these year-on-year as new concepts are introduced and added to their writing. Starting with common punctuationâ&#x20AC;&#x201D;such as full stops and speech marksâ&#x20AC;&#x201D;children will progress to diversifying their writing by using appropriate punctuation where necessary. This will include exclamation and question marks, colons and semi-colons, hyphens, bullet points and much more.